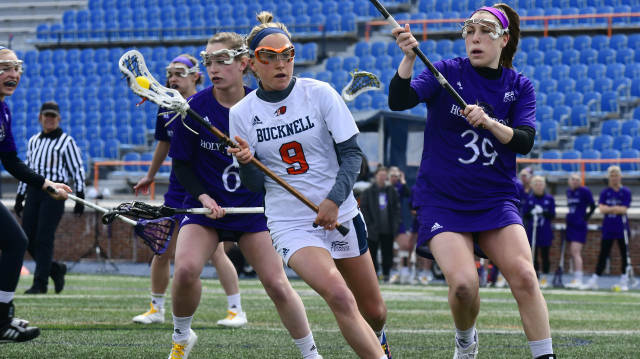 The women’s lacrosse team fought a hard battle on April 7 against the Holy Cross Crusaders, but lost a close contest with a final score of 12-11. The Orange and Blue move to 2-9 in the season and 1-4 in the Patriot League with the loss. Holy Cross dominated the first half of play, as the Crusaders had three free-position goals within the first five minutes and a 7-1 lead after 17 minutes, entering halftime with a 10-4 lead. The second half of the game proved to be the real test for the Bison as they attempted to overcome the deficit. Morgan Steinhacker ’20 scored the first goal of the second half, but Holy Cross retaliated by scoring the next two goals and taking the largest lead of the game at 12-5. With 20:52 left to go, the Bison went on a scoring run, netting six consecutive goals. Sarah Galzerano ’18 and Sarah Dohler ’20 each scored twice in this period to complete hat tricks. Tegan Warren ’20 and Mary Margaret Kenny ’18 also all added goals late in the second half to give the Bison a fighting chance. As the Bison offense began to work together, their defense jumped into action as well. Holy Cross committed 12 turnovers in the second half. Goalie Jamie DeWitt ’19 also had eight saves on the afternoon, with four coming in the second half. Down by one with 55 seconds left to play, the Bison forced the Crusaders into a shot clock violation and assume possession. Steinhacker was set up for the equalizer but was fouled as she drove to the net. She missed her free-position and Holy Cross gained possession, held the ball, and ran down the clock to the buzzer. Lillie Hunt ’20 and Audrey Walsh ’19 each had one goal and two assists, while Galzerano led the team in points with three goals and one assist. Kenney forced a game-best three turnovers and Erika Stube ’18 led the Orange and Blue with four ground balls. Steinhacker, with ten draw controls, became the fourth Bison in school history to ever reach double digits in this category in a single contest. “We got off to a slow start but in the second half, we came out strong and made a great comeback. We did not pull off a win, but I am really proud of how the team fought back and never gave up,” DeWitt said. Later in the week, on April 11 the Bison defeated the Ohio State Buckeyes by a score of 10-8. With an outstanding performance by Dewitt in goal, recording 13 saves, the Orange and the Blue improved their overall record to 3-9. The Bison will be on the road on April 14 to face Boston University in their next League matchup.